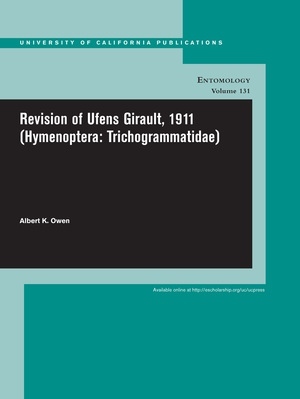 The first worldwide revision of the wasp genus Ufens Girault, 1911 (Hymenoptera: Trichogrammatidae: Oligositinae) is presented. Ufens is known to parasitize primarily hemipteran eggs and is a cosmopolitan genus most common in temperate and semi-arid regions such as the southwestern United States and Australia. Forty-three species are recognized here. Included in the revision are five species formerly in the genus Ufensia, herein synonymized, and 32 new species. In addition, seven species are removed from Ufens and placed in renewed combination in Mirufens. Because thirteen nominal species remain unidentifiable they are treated as nomina dubia. A worldwide key to species is provided. A preliminary phylogenetic hypothesis is presented utilizing both molecular and morphological data in maximum parsimony analysis. Molecular data, however, are limited to twelve of the recognized species. Thirty-seven morphological characters were utilized, both alone and together with molecular data. Due to greater confidence in molecular results and overall lack of resolution, the results of the paired-down molecular plus morphological analysis were utilized as a backbone for analyzing the complete morphological data set. Overall, results are inconclusive, with few relationships consistently recovered. There does appear to be a Holarctic clade, but even this result is tenuous.